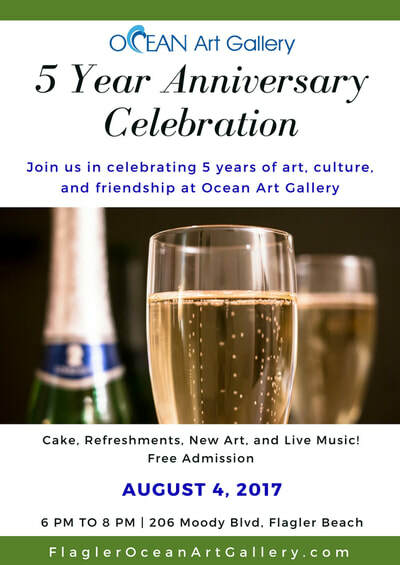 Ocean Art Gallery Hosts Lorraine Millspaugh and Celebrates 5th Anniversary! 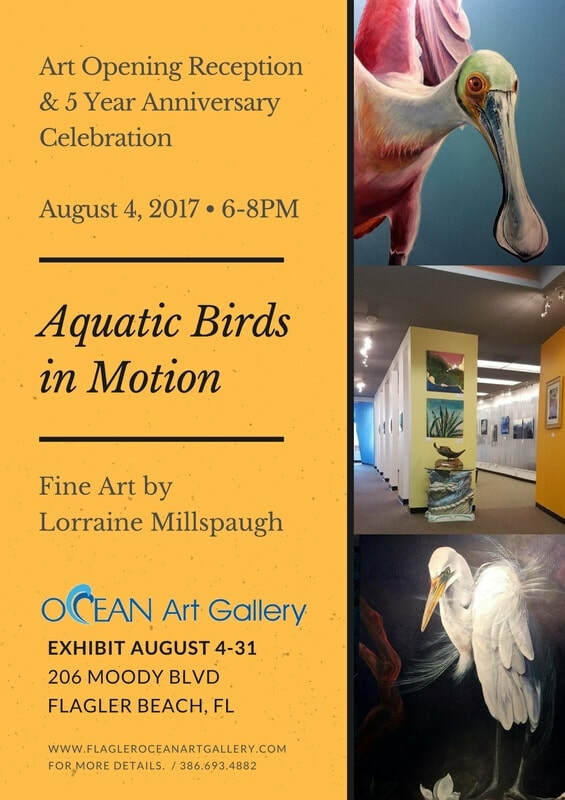 On Friday, August 4, Ocean Art Gallery will hold an art opening reception for Atlantic Beach artist Lorraine Millspaugh and simultaneously celebrate its fifth anniversary. 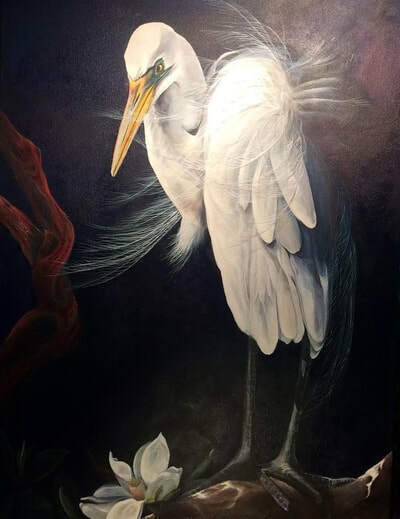 Gallery owner Frank Gromling has planned a gala event to include an art demonstration by the artist, live music by the DrCash Band, delicious refreshments including champagne, door prizes, and special pricing on all wall art. The celebration from 6-8 pm at 206 Moody Blvd (SR100) will welcome the gallery’s clients and friends, and is open to the public. 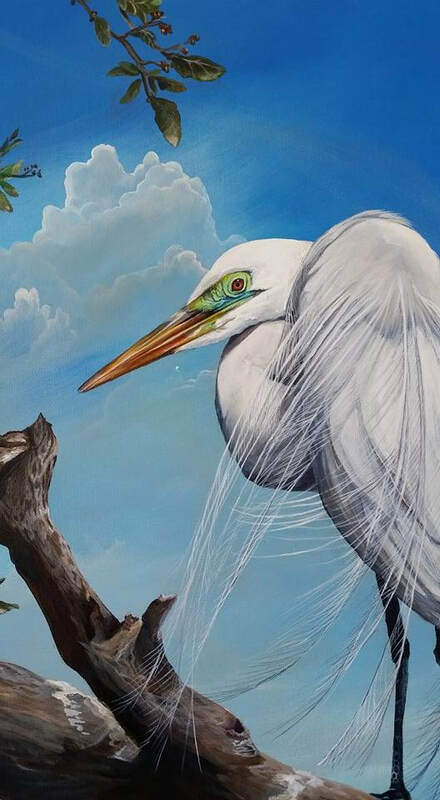 Gromling said he is particularly happy to have Lorraine Millspaugh as his featured artist for August because her month-long exhibit “Aquatic Birds in Motion” is one of the finest displays of Florida’s birds on canvas. Millspaugh is an avid photographer who researches aquatic birds and uses her photographs from the wild as inspiration for her paintings. Each painting has its own story created by the artist as the canvas comes to life. He added that her detail, vivid colors, and use of glazes and pastes create lifelike images of spectacular intensity. The artist created a successful art career painting on the front porch of a gallery in St. Augustine. Visitors to the city enjoyed watching her develop a painting and often spent hours talking with Millspaigh as she shared her thoughts about the chosen bird she was painting. These conversations led to art commissions for the artist, with her art now adorning walls in homes across the country. She continues this concept at Ocean Art Gallery by conducting painting demonstrations, as she did on July 15 for eight people. Demonstrations are being planned for the fall and winter season. Gromling is excited about celebrating the gallery’s fifth anniversary. When he started the gallery in 2012 as an off-shoot of his successful book publishing company, he had never been in the art business. Being a fast learner and always willing to take a risk when his heart and mind were in harmony, he launched Ocean Art Gallery in oceanfront space on SR A1A across from the Flagler Pier. Everyone is invited to join the celebration of “Aquatic Birds in Motion” and Ocean’s Fifth Anniversary. After celebrating, Gromling suggests making a night of it by attending First Friday in the Park and having dinner at one of the many fine restaurants with a few blocks of the gallery.